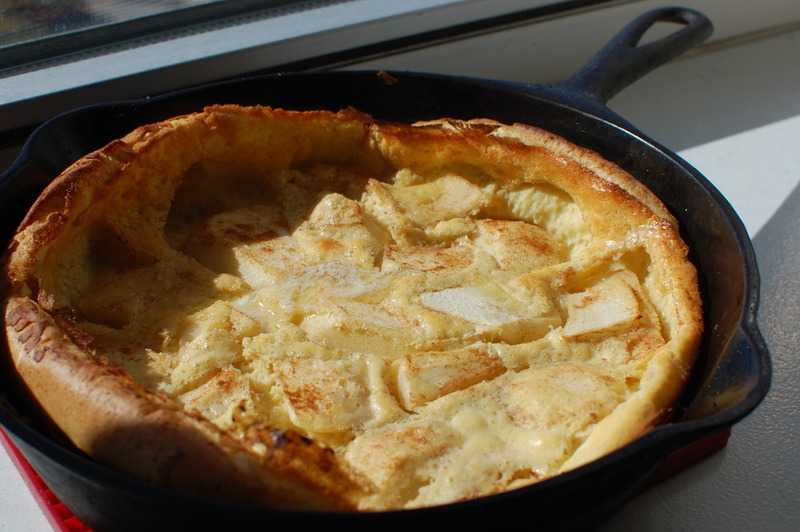 Puffy Oven Baked Apple Pancake - You're Making a Mess!You're Making a Mess! Perfect apple picking weather requires about 55 degrees, clear sky, and bright sun. Yesterday was perfect, so Sara and I headed to Kane County and harvested about 15 pounds of fruit, mainly Jonagold. About half of the bounty immediately went into apple sauce to be frozen and eaten over the next few months. The rest will be split up between pies, smoothies, regular ol' eating, and apple pancakes. It is apple pancakes that I came to speak of. I'm a huge fan of light, airy, eggy foods like crepes, popovers, and Yorkshire pudding. Baked pancakes, at least the ones I've had and the ones I make, are basically crepe batter with some cinnamon poured into a skillet (cast iron ideally) with apples and baked until lofty and golden brown. The result is better than any normal, boring buttermilk — crispy, a bit chewy, and cinnamon-y. They're great with just a bit of maple syrup (don't disgrace them with Aunt Jemima), lemon and sugar, or, best of all, the juice left over after you toss the apples in lemon, brown sugar, and cinnamon. It's a perfect Sunday breakfast, and actually comes together surprisingly quickly — about 10 minutes of prep and 20 minutes of baking. Try it now, while the apples are still delicious and the weather is crisp. Put your skillet on the stovetop and let it get hot. Turn off the heat, and add the butter so that it melts and coats the bottom. Set aside. Whisk together the brown sugar, lemon juice, cinnamon in a large bowl. Add the apple slices and toss until they're all thoroughly coated. Leave them in the bowl. Add milk, eggs, salt and vanilla together in a blender or food processor. Start it up, and gradually add the flour. Turn it up high for 5-10 seconds — the goal is to whip air into the mixture to cause it to puff up more when you bake it. If you are mixing by hand, whisk vigorously for about 30 seconds. Don't blend for more than 10-15 seconds or it could cause the batter to over-stiffen. Pour the just-mixed (if you've let the batter sit for more than a few minutes, whip it up for a few more seconds) batter into the skillet coated with melted butter. Arrange the apple pieces on top. Bake for 15-20 minutes, until the pancake has puffed and the middle is beginning to turn golden brown. Serve with some butter on top and drizzed with maple syrup, brown sugar, or (best of all) the juice left over in the bowl from the apples.